Malkasian creates, as she did in the critically acclaimed Percy Gloom, a fully realized, multi-layered world, inhabited by vividly realized characters. After a brutal injury in battle, Lester has no memory of his prior life. For the next thirty years his wife does everything to keep him from remembering—and re-constructing—a society, Blessedbowl, that elevates him as a hero. Blessedbowl is a cultural convergence of lies, memories, stories, and beliefs. Its people thrive on ideas of persecution, exceptionality, and enemies, convinced that war lurks just outside their walls. They have come to depend on Lester, their greatest war hero, to lead the charge once the Final Battle begins. Malkasian creates a densely textured social context, masterfully conveying the idiosyncratic physical domain with its spiraling structures and quasi-medieval architecture along with intimate yet plastic portraits of her characters in a rich, tonal pencil line. Temperance is a galvanizing work of empathy and violence by one of today’s the most thoughtful and accomplished cartoonists. This story is significantly darker than Percy Gloom and Rugrats, though it is told with Malkasian’s signature good natured humor, fairy tale-esque magic and wonder. Temperance deals with themes of truth, propaganda, and the way which war or a common enemy can unite a community, even when that war is fabricated out of thin air. Every character in the story is soaked in symbolism, and therefore the story itself almost becomes a poem. Super amazing and intense stuff. 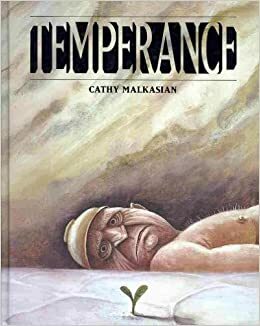 Temperance is a strange, winsome, complex tale that interweaves a handful of stories — that of Pa, of Peggy, of Minerva, of Lester, and of Temperance — into a narrative that explores themes of legacy, of truth, of control and dominance, and, unexpectedly, of hope.